and the music they sang was really swingin'. Stacks of wax to fit every occasion! I just found out that Kitty Kallen has died. She had such a smooth voice and was spotlighted here on Music For Every Mood in this post. Born Katie Kallen on May 25, 1921, she passed away at her home in Cuernavaca, Mexico last Thursday, January 7th, 2016. If you happen upon a recording of hers, don't pass it by. Her singing was wonderful! And a special treat for her fans out there - here's one of the last songs she recorded - Raining In My Heart. It had been a posthumous hit for Buddy Holly in 1959 and Kitty's version is from 1961, the year I was born. 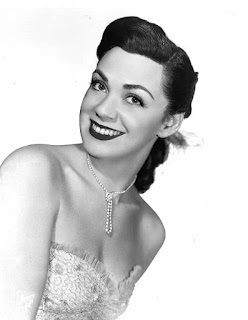 Here then is Kitty Kallen doing the lush big band sound of "Raining In My Heart." I've just been alerted by April herself that her autobiography, "Teach Me Tiger," has been published. 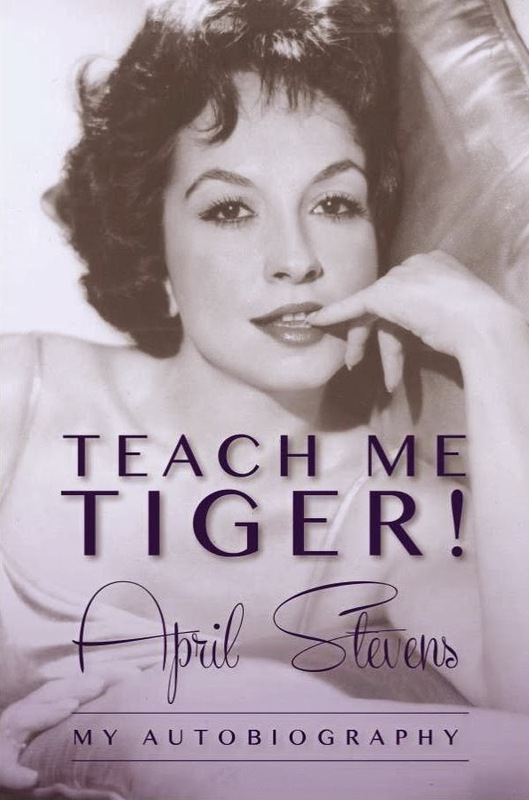 As you know, here on Music For Every Mood, we've spotlighted April and her fabulous voice before with a post, Teach Me Tiger, and it's appropriate seeing as how that's also the title she's chosen for her book. I'm sure you'll be interested in reading all about her life - from the beginning. Or as she put it best - "My life from a little girl in Niagara Falls, N.Y. to the present is “between the covers,” as they say, including 26 photos." So, be sure and get your copy today! Congratulations, April - I hope you have even more success with this endeavor! 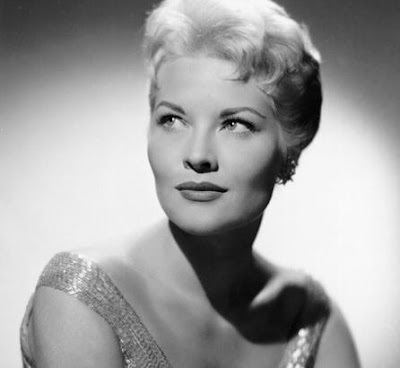 I just learned today that the great American singer and performer Patti Page died on January 1st, 2013. As you may know, I provided regular updates for her here, here and here, and she was also active on the concert circuit as well. Her manager would always post me with updates of where she would be performing. From a recent news article about her: She sold more than 100 million records and since her first hit in 1947, the singer never stopped touring and singing. I have to say that she will be greatly missed and my condolences go out to her family and friends. She was a great lady. I don't normally post anything this new, but a friend reminded me of this group today and so I thought I'd better get this up. 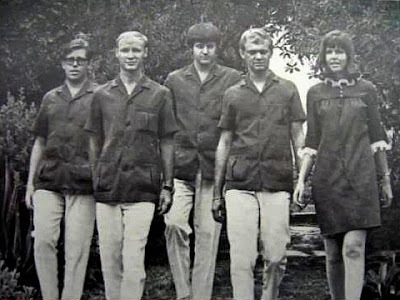 Four Jacks And A Jill were formed by four young men in South Africa under a different name, The Nevadas. The lineup on today's record consisted of Glenys Lynne on vocals, Clive Harding on bass, Till Hanneman on guitar, Bruce Bark on guitar and Tony Hughes on the drums. They had several hits in their native South Africa before they finally broke into the American charts with a #8 Billboard single called Master Jack. Some of their other hits included, Timothy, Mr. Nico, I Looked Back and Poor Lucy. They appeared on television variety shows, in motion pictures and even had their own tv show for awhile. On June 1st, 1968, Clive Harding and Glenys Hughes were married. In 1983, they became born-again Christians and broke the band up. They continued, but recording gospel music instead. They are referred to in the 1984 motion picture This Is Spinal Tap. Today's song features a repetitive, droning guitar part that sets the foundation for Glenys' beautiful voice. Glenys herself relates the story of Master Jack: “In certain mines, the foreman is called ‘Master Jack,’ and the song tells the story of a labourer who works diligently for this master for years and years and then decides to go out on his own and exercise his desires and aspirations as an individual to be something other than a labourer.” They were an extremely popular group in their native South Africa and in many other countries all over the world, so please be sure to give a listen to Four Jacks And A Jill singing their classic Master Jack. It's a whole lot easier than fetching a pail of water down from a hill. 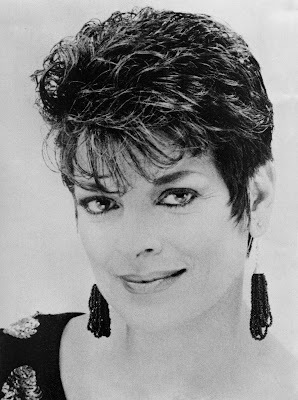 Diane Ray was born September 1st, 1942 in Gastonia, North Carolina. She was considered a rock and roll singer in the early 1960's and is best known for her 1963 hit single, Please Don't Talk To The Lifeguard, which was the flipside of today's record. It was her only hit, (so far), and she is known as a "one-hit wonder" because of it. 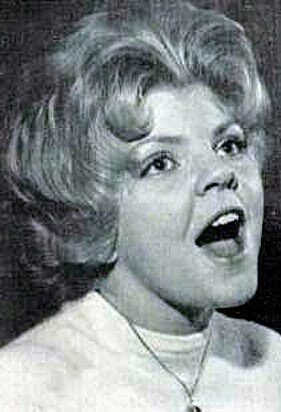 Her hit record was a good example of the early 1960's solo girl sound of rock and roll, but her voice shows more promise than mere top-40 radio. She recorded several more singles in that vein, but they were not hits. Songs such as Slow Dancin' With Don, My Summer Love, You'd Be So Proud Of Me, That Boy's Gonna Be Mine, Just So Bobby Can See and No Other Arms are some of her other recordings. There is a collection that gathers up her non-charting songs, the lp album called The Exciting Years. The b-side of her only hit, That's All I Want From You, however, reminds me more of the pop sound than rock and roll. It features an orchestra driven by a wailing saxophone and is a nice number for playing on your hi-fi stereo system on warm Summer days. So, put on your suntan lotion and please enjoy Diane Ray as she delivers That's All I Want From You. And remember: Walk, don't run at the pool! The lifeguard is watching you. Sometimes an artist will come along with talent on both sides of the microphone. Mike Figlio seems to have been such an artist. What little information I could find about him suggests that he started out as a singer and ended up becoming a record producer of some renown. He burst onto the scene in the late 1950's with songs such as today's tune and the flipside More Than Anything. I couldn't find many more songs attributed to him, but I did see where he began to work in recording studios by the mid-1960's. He gravitated to Nashville, Tennessee, where he produced such groups as R.E.O. Speedwagon, Marty Robbins, Jack Teagarden, Oar, John Hiatt, Joe Wise, David Clayton Thomas, Brothers Of The Southland, Skip Spence and Flatt and Scruggs. Quite an impressive resume. Today, Mike seems to have retired from the music business and hangs out with friends in an Italian restaurant located in Nashville called Savarino's. Savarino's has the vibe of a Brooklyn social club, where a group of Nashville Italians and Italian food fanatics while away hours gabbing, laughing, reminiscing. The most hallowed regulars have been immortalized with sandwiches named for them, sort of a Nashville Italian Hall of Fame. These include retired recording engineer/restaurateur Mike Figlio, Oh Boy Records head Al Bunetta, musician/producer Nick Pellegrino, rock legend Felix Cavaliere (of The Rascals) and health care executive Doug Shaugnesso. Mike's namesake sandwich is called the Mike Figlio and consists of grilled sausage, lettuce and tomatoes. It sounds pretty tasty to me. Billboard had this to say about today's release, back in their October 27th, 1958 issue: "Bouncy ballad with beat is given a cheerful warble by the lad with group and plucked string backing. Pleasant side can attract." I can also add that from the first notes, it comes across as an old, forgotten melody that you once knew and immediately recall. It's peppy arrangement is quite nice will leave you humming it's secondary melody by the chorus behind him long after it's stopped playing. It's the kind of song that leaves you with a happy feeling; and those are the best kind! 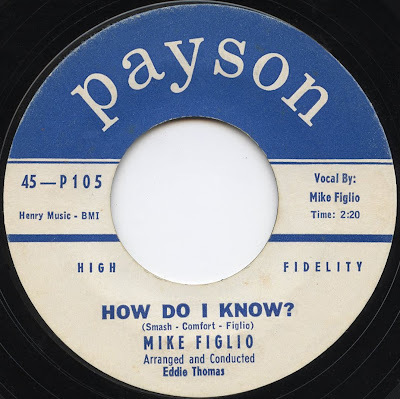 So, don't miss Mike Figlio as he warbles How Do I Know? I do know that you'll be pleasantly surprised and you'll enjoy it "more than anything." Today's post is a very special one indeed! Thanks to one of my readers here on Music For Every Mood, I was able to get in contact with an artist that has previously been featured on here. Namely, one Linda Leigh. In that previous article found here, I wasn't able to relate much of her story or even locate a picture of her. Well, that has all been rectified! I spoke with Linda herself a few moments ago and found out she is a very, very nice person. And what an interesting career she had. Sadly, for all of her fans, she no longer performs anymore, but when she did, she had one heck of a great voice. And now for a little on her life and career, from the person who lived it. She was born and performed under her birth name of Lucille Vanelli. 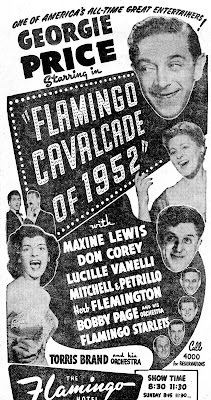 She must have always been talented for, by the age of 14, you can see from the bill above that she was a stalwart of the early Las Vegas scene, this in 1952, and still going by her own name. It was just after this period when she decided to adopt the stage name of "Linda Lee," before settling with "Linda Leigh." But, at the beginnings of her career, she performed at Las Vegas in such shows as Calvalcade Of Stars. You'll have to remember that in the early days of Vegas, it wasn't the huge tourist attraction it is now. When she played there, Las Vegas had only about 10 hotels, she said. During the 1950's, she was signed to Verve Records. While with them, she released songs such as What Good Does It Do Me; I Cry; Let Me and What Good Is A Memory. They also released an album called Songs For Your Boy Friend. It was right after this period that she shared the bill with Frank Sinatra, at his own Cal Neva Lodge in Nevada. She told me that for three summers in a row, she performed with him there. It was due to Frank's manager that they were introduced and Frank himself chose her to move to his own recording label, Reprise. It was during this period, which she said lasted for about a year, that she was signed to Reprise. After awhile, she began to want to perform where she wanted to go and on her own schedule so she broke away from Reprise and Frank. But as you've heard on the other side of this record and today's song, she had her full vocal powers in command and therefore could do it "her way." 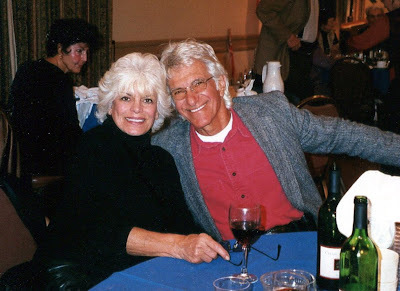 Another factor that caused her to go her own way was that Marilyn Monroe had spent a weekend at the Cal Neva Lodge the week before she died, Linda had also been at the Lodge that weekend and after that, she felt she needed to break away for awhile and have a family, "raise babies," as she called it. It has been approximately a half-century since the records detailed here were originally released and as such, they come to you in all their original vinyl glory, with imperfections intact. Each one is carefully researched to see that it hasn't been re-released in this digital age we now live in, but some of them are bound to "fly under the radar," so to speak, and be missed. If anyone holding the copyright to one of them objects to their being included on this blog, by all means, please let me know and the link to download them will immediately be removed. I do not wish to take money out of an artist's pocket, so I try to pick records that have not been anthologized in any way. If you like what you hear, I encourage you to try and find any music that may have been re-released by them and buy it. You can't go wrong with these artists! The goal here at Music For Every Mood is to provide glimpses of these stars from the past for today's generation. Artists that I have loved and listened to for a long time.